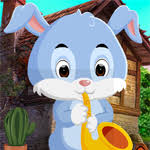 Games4King - G4K Naughty Rabbit Rescue Escape is another point and click escape game developed by Games4King. There were a few houses in a beautiful and magnificent village. The place was beautiful to see. There was a naughty rabbit living at that place. One day, that naughty rabbit was unexpectedly stuck in a house. It is your duty to rescue the naughty rabbit. It will help you to find the hidden clues where the naughty rabbit is to save this animal. Find all the clues and free the naughty rabbit. The trick is to get all the clues that are a bit harder to find, but somehow it may be interesting. Good luck and have fun! I had no trouble with any of the sliders. Slider comments are fine but I really needed some hints here. Still doing the poopy slider, will it ever end. It ends, can't do it.